Palavras-chave: Geographic Area. Strategic Environmental Assessment. Planning of the Territory. This study examines the representation of space in the Territory Planning (PDT) in the activity of transport with a focus space in Latin America and Brazil, as is assessed by six Strategic Environmental Assessment (SEA) reports. Among these six, two refer to Brazil, two in Bolivia, one in Chile and Peru. The objective of this work is to evaluate the representations of geographic space (GS) in Strategic Environmental Assessments Plans Planning of Transport Activity. This is justified because the concept of territorial planning is changing in his speech, in its meaning, which introduces new challenges. BERTIN, J. Sémiologie Graphique: les diagrammes, les réseaux, les cartes. 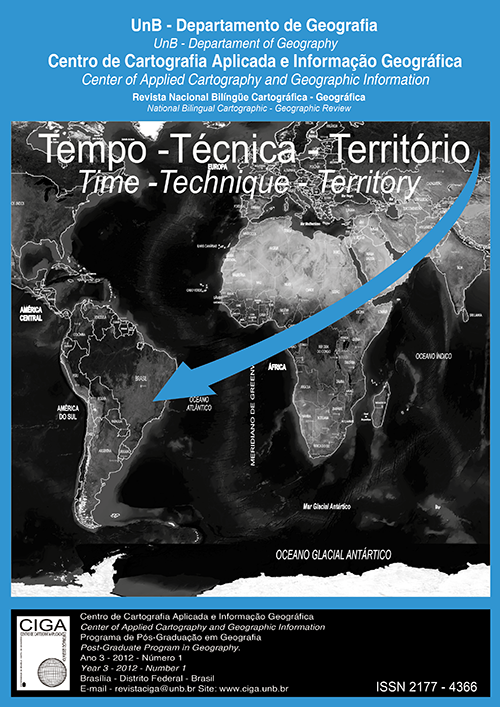 Geografia. Coord. Richard J. Chorley e Peter Hagett. São Paulo: EDUSP, 1975. DE MASI, D. (org.) A sociedade pós-industrial. 4a ed. São Paulo Senac, 2003. Thesis the School of Environmental Sciences University of East Anglia, England, 1998.
cultural. São Paulo: Loyola, 1994.
policy. Environment and Planning B; Planning and design, 10, pp 19-39,1983. Town Planning ReviewVol. 63, No. 2 (Apr., 1992), pp. 143-162, 1992. HEALEY, P.; KHAKEE A et alli (Eds.) Making strategic special plans: innovations in Europe. London, University College London, 1997. (London, Thousand Oaks, CA and New Delhi) Vol 2(2): 101–123, 2003. MANNHEIM, K. Sociology of Knowledge Tavistock Publication Limited, 1984.
básicas de Cartografia, Rio de Janeiro, 128p., 1998. Ambiental no Setor Transporte abril/2007. Editora Record Ltda, 13a ed. Rio de Janeiro, 2010.
geografía y ciencias sociales Universidad de Barcelona Nº 93, 15 de julio de 2001.
v. 1, n.1, p.11-24, ago. 1994. Assessment. Earthscan Publications Ltd, London, 1996. TOURAINE, A. La Société post-industrielle. Paris, Danoel, 1996. Journal of Planning Literature n.15 p.499, 2001.